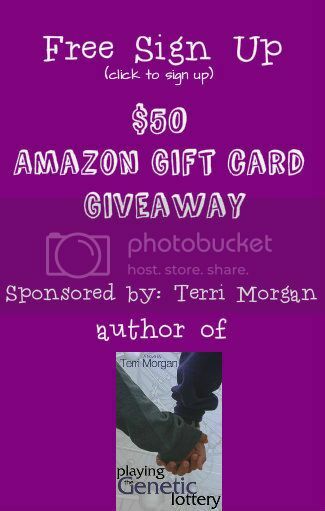 Participate in the "Beat the Winter Time Blues $50 Amazon Gift Card Giveaway" sponsored by author Terri Morgan. All you need to do is to make an announcement about the FREE sign-up on your blog by grabbing the code under the graphic (you can post the whole message, if you want) and then on January 16 post the giveaway (html post will be provided). This is a great way to gain more followers on your Facebook page. There will not be a "host page", each blogger's Facebook page will be listed individually on the Rafflecopter. Just shoot me an email and let me know if there is an alternative link that will be made available for free and I'll be back to sign up in a jiffy! There will not be a host page, instead each participating blogger will be individually listed in the rafflecopter. Rafflecopter has met with Facebook to insure this method does not violate their TOS.